Challenger the Eagle visits children at an elementary school in the metro D.C. area. 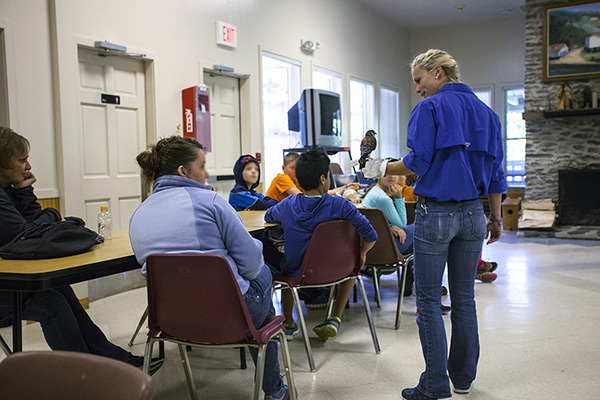 Students at an environmental center get up an up close look at Bo the American Kestral. 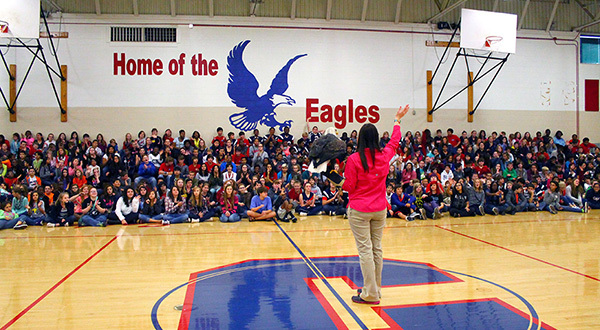 Challenger does over twenty school programs across the U.S. annually! 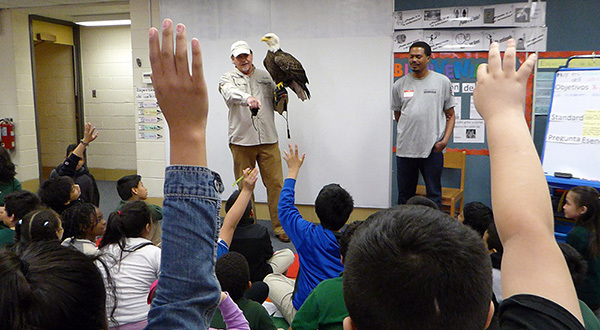 The AEF and Challenger teach students about the near demise of the Bald Eagle. Challenger visits Challenger Elementary School, home of the Eagles! Challenger soars over students at a school program in California. 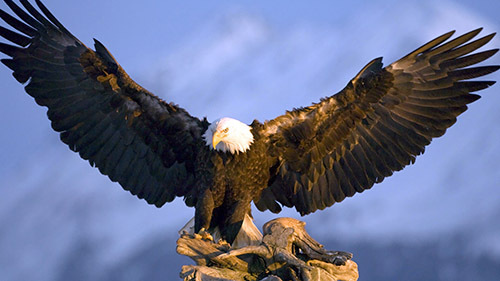 Our Bald Eagle and Birds of Prey programs are an exciting and effective educational tool to teach individuals of all ages about wildlife, environmental, and ecological concerns. It is presented by experienced professional AEF staff in an entertaining and captivating manner. Our full birds of prey programs features majestic non-releasable raptors that are superbly trained for educating audiences. The AEF presents a safe, up-close, and dramatic look at these fascinating creatures in a classroom, workplace, venue, auditorium, or gymnasium setting. The presentation gives an overview of raptors and how to identify them, their role in the ecosystem, laws protecting them, how to help them when they are injured or orphaned, and what students and adults can do personally to help protect them and the environment. Over and over, the AEF has seen the awe, wonder, and respect that birds of prey evoke from children and adults alike. The positive impact that is made on children is tremendous and life-long. We know from countless past programs that students do enjoy and learn from our presentations, and that the sight of these magnificent birds encourages students to get involved in preserving our precious natural heritage. In the summer of 2018, Honeysuckle Hills in Pigeon Forge, TN was the venue for this outreach program for a 4-H Photography Club class. Our birds were photographed by the students, who did an amazing job capturing their beauty! This slideshow/video was done by the students in the class. Our birds were the stars of the show, and the students taking the photography class learned about each bird from AEF staff members Jenna Penland and Karen Wilbur while honing their photography skills. The birds featured are Belle the Screech Owl, Jagger the Harris Hawk, Keowah the Red Tailed Hawk, Goose the Red Shouldered Hawk, and. of course, Bald Eagle Challenger. Upon request and dependent on availability, many raptor species can be represented, including a Bald Eagle, Golden Eagle, Red-Tailed Hawk, Harris’s Hawk, Barn Owl, Great Horned Owl, Peregrine Falcon, Barred Owl, Screech Owl, American Kestrel, Turkey Vulture, and Black Vulture. Some birds may perform a free-flight demonstration. The AEF will provide a 30-minute Birds Of Prey Program and an approximate 15-minute question and answer period. Upon availability, the AEF will provide bald eagle fact sheet handouts. 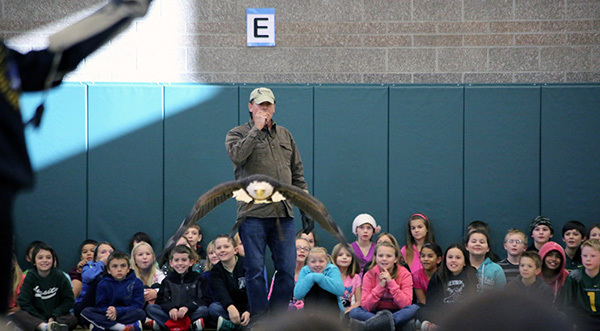 Request a Birds of Prey Presentation for your school, veterans home or workplace. Challenger the Bald Eagle travels from coast to coast performing free-flight demonstrations at large-scale events such as football games, baseball games, basketball games, conventions, and trade shows. 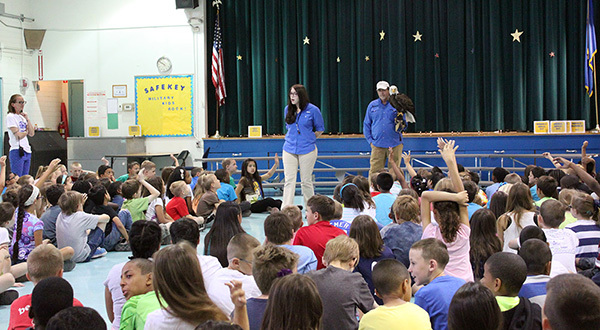 Whenever he lands in a new city, the AEF makes it a priority to locate a deserving school or veterans home and provide them with an educational, entertaining, and free program about Challenger the Eagle and Bald Eagle conservation. We invite you to add your school or veterans home to our database. Whenever we land in a new city, we check our database to locate a school or home to visit. Add your school or veterans home to our list for future Challenger visits.